by Chris Woodford. Last updated: April 1, 2019. Night-time is painted with neon: if you want to make a darkened city fizz with life, you can't go far wrong with neon lamps. These flashing tubes of color are like light sabers, slicing through our atavistic fears of the dark and making our urban spaces buzz into life. But that's just about all they are good for. If you want to create anything more sophisticated than colored lines of light, such as a clock, a calculator, or a mission-control countdown, you'll need lamps that are up to the job. Modern numeric displays are based on LEDs, LCDs, and VFDs. But, back in the 1950s, before these neat technologies became available, electronic boxes that needed to display numbers did so with amazing glowing lamps called nixie tubes; more recently, they've made a comeback in retro-style clocks (Apple inventor Steve Wozniak even has a watch made from nixie tubes). What are they and how do they work? Let's take a closer look! Photo: Three nixie tubes side by side. You can just about see the mesh-like anodes in front of the numbers—and notice how many wire connections they have coming out of the bottom. Photo by Adam Greig published on Flickr under a Creative Commons Attribution-ShareAlike Licence. What is a nixie tube? Screenshot: If you like nixies but don't want to go to the trouble and expense of building your own retro counter or clock, check out the nixie widgets and apps you can download for your smartphone. Here I'm testing two different nixie clock widgets side by side on an Android phone. You'll find similar apps on iTunes for Apple devices. If you've got a digital alarm clock (or a timer on a microwave oven, VCR, or DVD player), chances are it has blue-green numbers (in which case, it's using a vacuum fluorescent display, VFD) or red ones (which means it's made from light-emitting diodes, LEDs). Either way, you'll notice that it displays each of the digits in the time (10:30 or whatever) by lighting up a pattern of seven quite separate bars, commonly called "segments." You can write all the numbers 0–9 with a seven-segment display and quite a few letters and words as well. 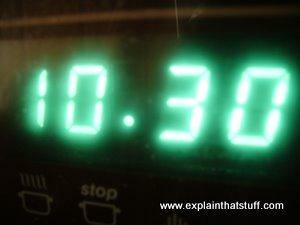 Photo: A typical vacuum fluorescent display on a cooker timer. Whenever you see this blueish-green color, you can be sure you're looking at a VFD. 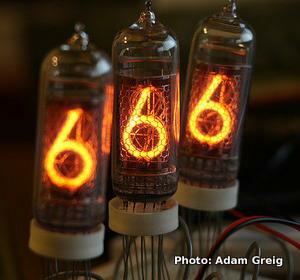 Nixie tubes also display the numbers 0–9 but in a completely different way. 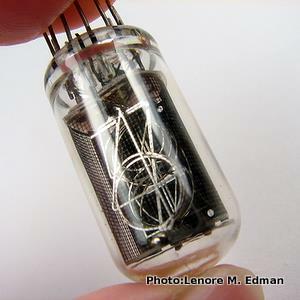 Look closely at a nixie tube and you'll see it has the ten decimal digits made out of bent wire and arranged in a stack, one in front of the other, inside a sealed glass bulb. Underneath the bulb, there are lots of electrical contacts. Wire these up to an appropriate electronic circuit and you can make the numbers count up in sequence, tell the time, or do all kinds of other neat things. Unlike VFDs and LEDs, one of the quirky things about nixie tubes is that different numbers light up in front of or behind one another (on different "planes"), so some digits appear brighter than others and closer to or further from your eye. You can just about see that on this Wikimedia photo of a counting nixie tube. How does a nixie tube work? Nixie tubes work a lot like neon lamps (although not exactly like neon lamps, as we'll see in a moment). Why do all the metal numbers have to be sealed inside a glass bulb? Well, you can't see just by looking, but the glass bulb is filled with a mixture of invisible gases (usually neon, mercury, and argon), and its purpose is to stop those gases from escaping (mercury is toxic so you don't want that floating around anywhere near you). The bent metal wires that display each number aren't filaments, like the ones in an incandescent lamp. Each of them works as a separate negative terminal (cathode) in what is effectively a gas-discharge tube—so one nixie tube has ten cathodes. The cathodes don't actually touch one another but are kept apart by tiny ceramic spacers. There's also a single positive terminal (anode), shaped like a mesh or grid, that's wrapped around the stack of numeric cathodes and serves all 10 of them. Photo: You can clearly see the ten stacked cathodes shaped like numbers, one in front of another, in this fantastic photo of an unlit nixie tube. You can also see the grid-like anode "cage" that surrounds them and the connections coming off the top of the tube. This is one of the photos from Evil Mad Scientist's excellent Nixie tube take apart, by Lenore M. Edman, www.evilmadscientist.com, published on Flickr under a Creative Commons Attribution Licence. Different kinds of lamps make light in completely different ways. Old-style electric lights and flashlights (torches) use incandescent lamps, which glow because a metal filament inside them gets hot when electricity flows through it. If those lamps glow red hot, fluorescent lamps glow "white cold": they turn electricity into invisible ultraviolet light, which gets converted into visible light by the white coating that lines the inside of their tubes. Neon lamps are similar to fluorescent lamps except that they make visible (red) light directly. When you switch on the power, atoms of neon gas are split apart inside the tube to make electrons and ions, which collide, and give off red-colored light (as we explain fully in our article on neon lamps). Nixie tubes are very similar to neon lamps. Both look a bit like cathode-ray tubes (old-style televisions), in which electrons boil off a hot metal cathode at one end and race down the tube toward a positively charged anode at the other. But in neon lamps and nixies, the cathodes remain relatively cool (tubes like this are described as "cold cathode," even though they're generally on the warm side—about human body temperature) but the gas mixture that surrounds them is at a very low pressure (perhaps 1/100th of normal atmospheric pressure or even less—so typically less than 1000Pa or 0.01 atmospheres). When a voltage of about 170–180 volts is applied between the anode and one of the cathodes, the low-pressure gas becomes ionized (its atoms or molecules are turned into positively charged ions and negatively charged electrons). When electrons, ions, and atoms collide with one another (and with metal atoms ejected or "sputtered" from the cathode), we get a glowing, fuzzy "coating" of light forming all around the cathode, very close to it, that follows its shape precisely—effectively making it appear as though one of the numbers 0–9 is illuminated. Applying a voltage to a different cathode makes a different digit "light up." If you want a more detailed explanation, read the box below; if that's enough for you, you can safely skip the box to the text underneath it. What makes that ghostly glow? In an incandescent lamp, the coiled filament glows because it's red or white hot. But in a nixie tube, something very different is going on: first of all, the cathode is cold, so the glow isn't being produced by heat; second, the glow happens some distance beyond the cathode that's producing it—it's a kind of "ghost of a glow" some way removed from the cathode itself. What we see here is called a cold-cathode glow discharge. Why does it happen... and why is it some distance away from the cathode? Photo: In this excellent closeup, you can see very clearly how the red glow discharge in a nixie tube happens outside and just beyond the metal cathode, following its shape precisely. Although you can't see it here, there is actually a thin, completely dark region (the Aston dark space) between the cathode and the glow. Photo by Georg-Johann Lay (edited by Richard Bartz) courtesy of Wikimedia Commons published under a Creative Commons Attribution-ShareAlike Licence. When a high-enough voltage is applied between the wire-mesh anode and one of the numeric cathodes, the molecules or atoms of the low-pressure gas inside the glass tube split into positively charged ions and negatively charged electrons, making a sort of "soup" of hot plasma. The positive ions are pulled toward the negatively charged cathode (the wire-outline number), while the negative electrons head for the positively charged anode mesh. When the ions hit the cathode, they knock further (secondary) electrons out of it, which also head out into the plasma. It's this dual movement of charged particles that allows an electric current to flow through the tube. Much of the light that glows from a nixie tube is produced by collisions between gas atoms, ions, and electrons, just like in a neon tube. But some of it is also produced another way. Some of the positive ions hit the cathode directly, while others hit the gas atoms and push those into the cathode instead. Like tiny atomic bullets fired at a wall, these small gas atoms and ions chip bigger metal atoms out of the cathode so they're ejected into the main part of the tube—a process known as sputtering. These sputtered atoms then undergo collisions of their own in the plasma, absorbing energy to become "excited" and unstable, then losing their energy again by giving off photons of light and contributing to the overall glow we can see. So, in short, the glow inside a nixie tube is produced by a combination of ionization and sputtering. Glow discharges like this are complex and, in some tubes, produce a whole series of light and dark bands between the anode and the cathode (check out this neat video of a glow discharge tube experiment). Nixie tubes are carefully designed so that all we can really see is a single glow surrounding the cathode. But if you're observant, you'll also see that there's a thin, completely dark area between the glow and the cathode (called the Aston dark space). Beyond that is the ghostly "cathode glow" we see forming the lit-up number. So why the space between the cathode and the glow? The glow happens when electrons, fired out from the cathode and traveling toward the anode, collide with atoms and ions in the main part of the tube. The electrons accelerate from the cathode to the anode, picking up speed and energy as they go. When they're very near the cathode, the electrons vastly outnumber the ions and atoms there and they don't have much energy. So the chance of a collision between an electron and an atom is relatively small and, even if it does happen, the electron doesn't have enough energy to excite the atom into giving off light. That's why this area is dark. A bit further away from the cathode, the electrons have gained more speed and more energy, and there are more atoms for them to collide with. When electrons collide with atoms and ions in this region, they can excite them enough to make them give off photons of visible light—hence the "cathode glow." Gas atoms in the tube are at low-pressure. 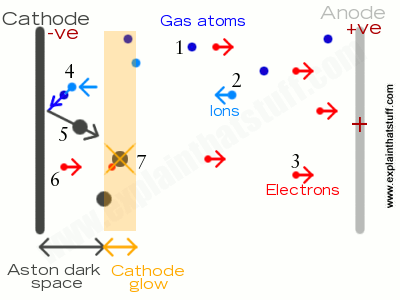 When a high enough voltage ("ionization potential") is applied between the anode and cathode, the atoms split into a plasma of ions and electrons. These ejected, negatively charged electrons (known as secondary electrons) are attracted toward the positively charged anode. Collisions between these electrons and the ions they encounter produce most of the light in the tube, just like in a neon lamp. Near the cathode, ions push gas atoms into the cathode itself. Metal atoms are ejected ("sputtered") from the surface of the cathode. Electrons leaving the cathode are pulled toward the positively charged anode. Close to the cathode, there are more electrons than ions but the electrons have relatively low speed and energy. Collisions between electrons and atoms or ions don't excite them enough to produce light, so this area is dark (the Aston dark space). At a certain distance from the cathode, electrons have picked up more speed and energy. When they collide with atoms or ions here, they produce photons of visible light—giving that familiar glow just beyond the cathode. Nixie tubes are bright and easy-to-read, with properly rounded numbers (unlike the squared-off "compromise" digits made by LEDs, LCDs, and VFDs, which can be confusing if you're not used to them), so they're a popular choice for instruments that need to be read in poor light or darkness. Although essentially obsolete, they're still widely available and relatively inexpensive, largely because they were manufactured in very large quantities in the Soviet Union (Russia and its former republics). They're also extremely reliable and, because each number is lit separately, can continue working (after a fashion) even if one or more of their cathodes fail. 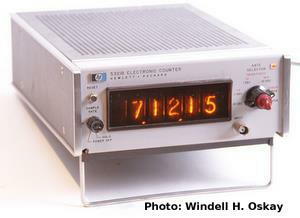 Photo: A typical use for nixie tubes—in the display of an electronic frequency counter (a Hewlett Packard 5321B). You can see here how different digits are displayed in different planes (so some numbers seem slightly further forward than others), giving the slightly wonky appearance that makes retro-nixies so appealing! Photo by Windell H. Oskay, www.evilmadscientist.com, published on Flickr under a Creative Commons Attribution Licence. On the downside, compared to more modern displays, they're powered by inconveniently high voltages (making them hard to use with low-voltage integrated circuit computer chips) and relatively large amounts of power and they can fail for a variety of reasons. Since they're made of glass and contain mercury, they can represent a health hazard if and when they break (though that's quite rare, since they're usually built inside sturdy electronic gadgets). The stacking of cathodes, one in front of the other, means nixie tubes can only be clearly viewed from straight in front (unlike other displays, which can be seen from a wider angle either side). And nixies are also quite large compared to tiny modern displays, so they're hard to use in the kind of compact gadgets where we'd now mostly use LCD displays (imagine something like an MP3 player with a huge display made of nixies!). You'll often read that nixies were pioneered by the Burroughs Corporation (a leading mainframe computer manufacturer in the mid-20th century)—but that's only part of the story. 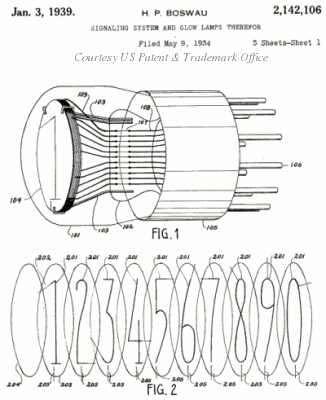 Artwork: US Patent #2,142,106: Signalling System and Glow Lamps Therefor—two of the drawings from Hans Boswau's 1930s patent for an electrical number indicator that looks very like a nixie tube. Artwork courtesy of US Patent and Trademark Office. Burroughs marketed the technology in the mid 1950s under the brand names "Haydu" and "HB" (Haydu Brothers), and then licensed it to many other electronics firms. Haydu was a small electronics company in New Jersey, run by two Hungarian brothers named George and Zoltan Haydu, which Burroughs had purchased to manufacture the tubes. How the name "nixie" came about is something of a joke. The story goes that a draftsman sketching out designs for one of these tubes marked his work "NIX1" (Numeric Indicator Experimental#1), the nickname stuck, and Burroughs was wise enough to trademark "nixie" ("electronic indicator tubes") in December 1956 (this use of the trademark is now marked as "dead/expired"). Nixie tubes were hugely popular and remained so until LEDs became cheaper to manufacture in the 1970s—a development that seemed to pass Burroughs by: an interesting little news item from New Scientist (January 13, 1972) reported that: "Burroughs professes to being unimpressed by the threat posed by LEDs, claiming that they have been oversold in recent months..." Not a good call. "The fact that the exposed parts of the cathode of a glow lamp are entirely surrounded by a thin film of luminous discharge may be utilized to display any desired character by means of properly shaped cathodes. A cathode consisting of a wire in the form of the numeral 1 will, when ignited, produce a luminous outline of the numeral 1, and similarly any other desired character may be formed." Nixie tube take apart: Since a nixie tube contains mercury, it's hazardous to break one apart. Fortunately, those good folk at Evil Mad Scientist Labs have done the dirty work for us in this neat little article. Gas Discharge Displays: Some great photos of nixie tubes and related displays from The Vintage Technology Association website. Glow Discharge: A website based on the work of the late Dr Richard Payling, which explains some of the complex physics behind glow discharges and sputtering. The Nixie Tube Story: The Neon Display Tech That Engineers Can't Quit by Jens Boos. IEEE Spectrum. June 25, 2018. A longer history of nixies. Build a Clock With Lixies, the Nixie-⁠Tube Lookalike by David Schneider. IEEE Spectrum. January 26, 2018. How to make something that looks like a nixie clock using LEDs, plastic sheets, and total internal reflection. Nixie Tube Wristwatch. Coolest. Watch. Ever by Charlie Sorrel. Wired. July 23, 2007. How do you make a practical nixie watch? New Life For Nixies by Glenn Zorpette. IEEE Spectrum, June 3, 2002. A review of some lovingly made nixie clocks. Glow Discharge Mass Spectrometry, Methods by Annemie Bogaerts. Encyclopedia of Spectroscopy and Spectrometry 1999, Pages 669–676. A good simple introduction to the two key glow discharge processes (ionization and sputtering). Changing Patterns in Visual Display by Ron Brown. This fascinating (and now historical) article from New Scientist, 13 January 1972, heralds the arrival of LEDs and anticipates the demise of nixie tubes. US Patent 2,142,106: Signalling System and Glow Lamps Therefor by Hans Boswau, January 3, 1939. This is Boswau's original 1939 patent for a nixie-like lamp. US Patent 3,158,854: Electronic counter by Irving Forman et al, November 24, 1964. A digital counter circuit based on nixie tubes. Glow Discharge Optical Emission Spectroscopy: A Practical Guide by Richard Payling and Thomas Nelis. Royal Society of Chemistry, 2007. Glow Discharge Plasmas in Analytical Spectroscopy by R. Kenneth Marcus, José A. C. Broekaert (eds). Wiley, 2003.